Image: DC Comics. Art by Patrick Gleason, Mick Gray, John Kalisz, and Rob Leigh. The ongoing story in Superman and Action Comics has been a hell of a ride for not one, but two Clark Kents. Last week, we learned about the true mastermind behind the entire crazy plot—and yet, this week, there’s been a new twist that somehow even tops that for madness. So, a quick recap: Last week, we learned that fourth-wall-warping fifth dimensional imp Mr. Mxyzptlk was the secret identity of the weird Clark Kent that’s been running around in DC’s Rebirth comics—yes, a separate Clark Kent, not to be confused with either the New 52 Clark Kent, who is dead, or Clark “White” née Kent, the Clark of the Pre-New-52 reboot, currently operating as Superman. Anyway, Mxyzptlk, angered at Superman for forgetting him during that whole, you know, entire reboot of the known multiverse thing, has kidnapped Clark and Lois’ son Jon and locked him in the fifth dimension—and the longer he stays, the more likely Clark and Lois will forget he ever existed. 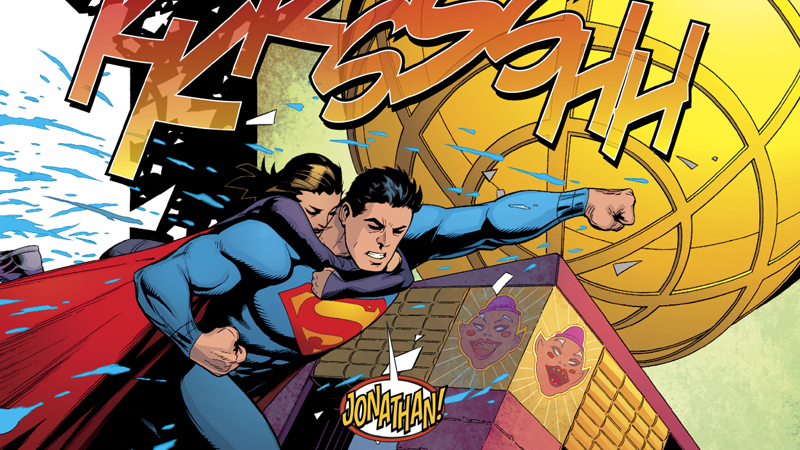 In this week’s Superman #19 (by Peter J. Tomasi, Patrick Gleason, Mick Gray, John Kalisz, and Rob Leigh), Mxyzptlk offers Superman and Lois a challenge: climb to the top of a hellishly weird tower in the fifth dimension, and they get their son back (this is, of course, a trap). Meanwhile, Jon is floating around in the limbo between worlds, glowing in a strange blue essence—the same one his father and mother also glow in once they enter the fifth dimension, for reasons unexplained by Mxyptlk. As the photo indicated, these balls of red energy are the essences of none other than the New 52 Clark and Lois, who both perished, and both burst into strange red light at the end of their lives. For whatever reason, their energy was been transported to Mxyzptlk’s dimension. Art from Superman #52 and Superwoman #1. The essences of the New 52 Lois and Clark help lead Jon to his parents, who are trapped in Mxzyptlk’s bizarre prison and starting to forget their son. In one last moment of desperation, Jon summons these red balls of energy to him, and then plunges towards his parents and Mxyzptlk, resulting in a fiery explosion. When the interdimensional dust settles, Jon is fine. But he’s not accompanied by his parents. It’s the Clark and Lois of the New 52, and the pre-New 52 Clark and Lois are nowhere to be seen. So what the hell is going on? Have Supermen old and new merged into one new character? Or are Jon’s parents gone for good, replaced by the essence of their New 52 incarnations? It’s worth mentioning, of course, that this all took place within Mxyzptlk’s fifth-dimensional limbo world of total nonsense, so it could all just be a bizarre trick or metaphysical quibble that’ll be resolved within moments of the next issue. That doesn’t stop it from being one hell of a crazy cliffhanger, though.